You see a beautiful gold ring resting comfortably on a tiny pillow. Its design catches your eye and the seller compliments you on your style. You are in love with that gold ring, especially since its price is really good. We all have those moments when a piece of jewelry catches our attention and we buy it. But, sometimes, what seems like a bargain is a rip off in disguise. Of course, we are not talking about respectable jewelry shops and brands here. We are talking about those jewelry sellers you encounter on holidays in busy markets and at the street corner. Even though you have your suspicions that the elegant gold ring may be fake, you can’t help but think “what if it’s not?”. You end up buying it and, sometimes, you are in luck. But most of the times, you discover after wearing it for a couple of days, that its thin golden layer is not so golden anymore. To help you avoid this disappointment, we have decided to let you know how you can test gold. Read further to find out if your gold jewelry is real or fake. Usually, jewelers test a gold alloy to verify its purity using the acid test. This test is very reliable and the results appear immediately. They simply scratch your gold ring against a testing slab to leave a mark on the slab. After that, they apply nitric acid to the slab and wait to see if the scratch mark gets dissolved. The nitric acid comes in various concentrations and jewelers use different concentrations depending on the karat of the piece of jewelry. If the scratch dissolves under nitric acid, then your item is simply a colored piece of metal. If it doesn’t, then you have real gold on your hands. On the market, you can find gold testing kits which help you use this method at home. You have to remember, though, to create a deep scratch in order to get to the metal underneath the top layer. If you have a gold-plated ring and the scratch is very light, you will only get gold on the testing slab. As a result, the test will show that you have a solid gold ring instead of a plated one. The professional gold testing method is great for jewelry you already have. Otherwise, it is unlikely that the seller will let you scratch the ring without buying it. But, rest assured, there are other methods that can help you test gold. Some gold jewelry pieces have another marking right next to the karat. If you can see GP (gold-plated), GF (gold-filled), RGP (rolled gold plate), GEP (gold electroplate) or HE (heavy gold electroplate), it means that your gold ring is not solid gold. 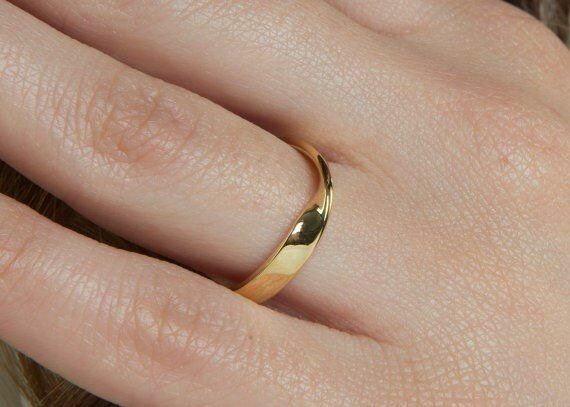 If a supposedly gold ring is missing its markings, chances are that it is not gold. But even if it has markings, you cannot be 100% sure you have a solid gold piece. Look for any deep scratch on the ring to see if you notice a discoloration. If you do, it means there is another type of metal underneath the gold layer. Also, assess the color of the ring. If it has a vivid intense yellow color, it might be gold-plated with 24k gold. Solid gold doesn’t have the color of 24k gold because of the alloy. Also, 24k gold is never used to create solid gold jewelry because it is too soft. It’s a good idea to have a small magnet with you at all times. If you are suspecting that the gold ring is not real gold, use the magnet. Gold is not magnetic, which means that the jewelry should not be attracted to the magnet. If it is, there are 90% chances that the ring is not gold. We leave that 10 % for the situations when magnetic metals are used in the gold alloy. However, in those situations, you should feel that the piece of jewelry is slightly attracted to the magnet and it doesn’t fly over to it. There are other methods to check gold, like the bite test. You have probably seen this method in Western movies. But this method is very unreliable because 10k and 14k gold alloys are too hard for you to leave teeth marks on them. However, 10k and 14k are still solid gold. Our advice is to check the markings, the color of the gold ring and do the magnet test. If it fails one of these tests, it’s better to be safe than sorry. For more jewelry information, read our other articles as well. Check out Ana Luisa online jewelry shop to view our solid gold jewelry collection. Should You Get a Non Diamond Engagement Ring? Is a Moonstone Ring a Good Alternative to a Diamond Engagement Ring? What should you look for when buying a cocktail ring? Which engagement ring setting is the best? Promise ring vs engagement ring – what is the difference?